This past weekend was a big one for Travis, Olive, and me – we added a new member to our family! We’ve been courting Ethel for awhile now, working with a rescue group to try to make her ours. And Friday it officially happened! She’s an Italian Greyhound rescue, and she’s just so sweet. For those of y’all that know Olive, you know she’s a dog full of personality – and was a terror for the first few months we had her. On the contrary, Ethel has been quite easy, save for a couple of little accidents. We’re all adjusting and I think she’s going to love our family – and it’s just so cute with two little black and white dogs running around the house! 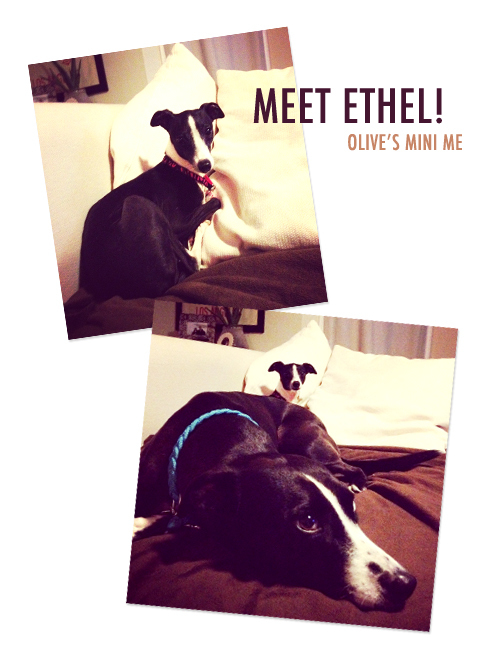 So look forward to a lot of new dog pics on this blog – of Olive and her Mini Me, Ethel.